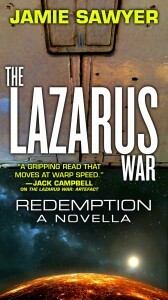 Today is release day for the next instalment in THE LAZARUS WAR series: REDEMPTION! It’s amazing how fast the release date has come around. REDEMPTION is a bit different to the other releases in series so far, featuring a new narrator and a different perspective on the unfolding events of the war. I’m really excited about this new release, and hope that readers will enjoy it too. REDEMPTION is set at the very end of LEGION, providing a bridge between the events of that book and the next novel ORIGINS. Many readers are probably wondering how we ended up with the Alliance in such a state of disarray in LEGION… well, REDEMPTION should give you some answers! We will get to see the dying hours of Liberty Point, through the eyes of Taniya Coetzer. It’s been great to see support for THE LAZARUS WAR series so far, and I’ve been really pleased with feedback from readers on both ARTEFACT and LEGION. If you’ve enjoyed my books, feel free to get in touch. You can also follow me on Twitter on @JSawyerAuthor, where I post all of the latest news from the front. I just finished reading Redemption (much later than I would of liked but I finally had time) and it was absolutely amazing! The Directorate are very vicious enemies aren’t they? They are everywhere, hiding in plain sight and strike when least expected, with no considerations for civilians. They are truly a force to be reckoned with. But the Krell are undoubtedly worse, brutal bastards. Anyway, I really admire you’re writing style, it’s fluid, action packed and never dull. I have read all 3 of your books now in one sitting, which isn’t something I’m able to do often. You’ve got a lot of talent. Thank you so much for the kind words! It’s always great to hear from a reader and I really appreciate your comments. There’s much more to come from both the Directorate and the Krell… I’m currently editing ORIGINS and think you’ll like that a lot too. Don’t forget to review me somewhere if you can!